Tori Smith holds a PhD in Modern European and Women’s History from Rutgers University. Tori began her academic career as an undergraduate at University College, long before SDS existed. She was lucky, however, to take courses with many of the professors who later built the program from the ground up, so she is especially happy to be back at UC teaching Lesbian Studies in SDS. Tori has been active in queer politics in the UK, New York and Toronto. 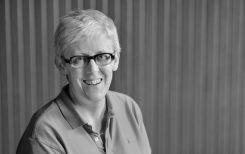 Her teaching and research interests include the history of lesbian and gay activism, and popular representations of lesbians.